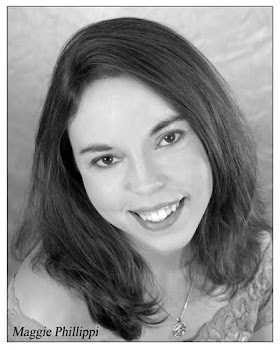 Maggie's blog: Just how grainy is too grainy? Just how grainy is too grainy? 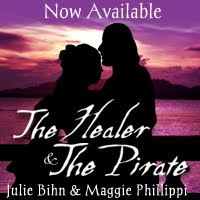 For weeks I slaved over making the cover for the Healer and the Pirate just perfect. It got to the point that Julie was wishing we’d just buy an image. But I was determined. I made my own fonts, took my own pictures... everything was as right as it could be without spending $300. Then it came time to pull the trigger and finally send the book out into the world to be viewed by millions of people. 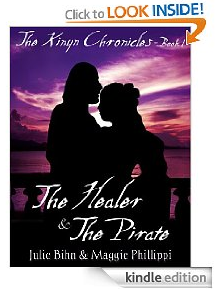 And to my horror, the image appeared like a grainy mess in Amazon’s book details preview. I sat for a good two days fearing that my cover wasn’t good enough. Despite the warning that the image in the book details preview would be a little pixelated, I feared ours was too pixelated. How could something that looked that bad in preview turn out fine? I changed the DPI, the size, made a new file and nothing I did fixed how grainy the thumbnail appeared. I searched Google and found several other people with my same fear. At least I was not alone. But I was still scared. Just how grainy is too grainy? Well my fears were unfounded of course. I tend to be a worrier anyway. 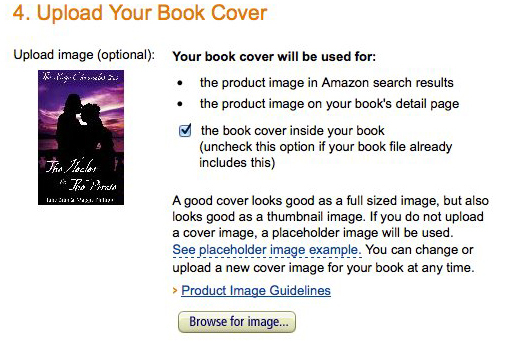 So if you’re like me and adding your book to Amazon, don’t fret over their grainy preview image. They take your large pictures and squish them into tiny thumbnails which causes the low quality and then utter mayhem. Now seeing that you only submit one photo, I don’t know how they get the “look inside” graphic to appear nice when the preview image that is also squished appears grainy. But it does. Nothing to worry about there! This really bothered me though as I wish they’d find a better way to let us preview what it looks like in thumbnail form before pulling the trigger and letting a million people see it. But all is well that ends well. The final image was 600x800 and under 127KB per the Amazon guidelines. If you click on the image above, you can go to the our Amazon page and click the "look inside" to see the final product in all its glory!